Story Theater Company (STC) offers quality theatrical opportunities for area children and provides them with positive role models who teach the fundamentals of theater in a welcoming environment that encourages self-confidence, responsibility, teamwork, and inclusion of all. 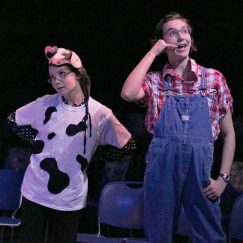 STC produces four full-length shows, a touring production, and a ten-minute play festival each season as well as offering a variety of educational theater workshops, camps, and clubs. In our effort to afford everyone the opportunity to experience live theater, we have donated hundreds of free tickets to area social service agencies, provided scholarship aid to participants, and kept tickets reasonably priced. Story Theater Company is a non-profit, 501(c)3 organization founded in 2006. To date, we have worked with over 400 children in performances, workshops, and festivals. We employ area artists and ISU Theatre students as instructors, directors, and designers. Well over 35,000 audience members have seen our performances. We invite you to play a part!